The annual population status report for the monarch butterfly (Danaus plexippus) has been released showing a 27 percent decrease from last year’s population. Populations of this once-common iconic black and orange butterfly have plummeted by approximately 90 percent in just the last two decades. The threats to the species are the loss of habitat in the United States–both the lack of availability of milkweed, the only host food plant for monarch caterpillars, as well as nectar plants needed by adults–through land conversion of habitat for agriculture, removal of native plants and the use of pesticides, and loss of habitat in Mexico from illegal logging around the monarchs’ overwintering habitat. The new population numbers underscore the need to continue conservation measures to reverse this trend. The population is evaluated by measuring the number of hectares occupied by the monarch butterflies in their overwintering habitat in Mexico. This year there are an estimated 109 million monarchs occupying just 2.91 hectares (7.2 acres), down from 150 million last year covering 4.01 hectares (9.9 acres). The monarch population found west of the Rockies, which migrates to California rather than Mexico, has also severely declined but looks to have remained at the same level as last year. Despite the alarming overall decline in the monarch population, there is some reason to be cautiously optimistic about efforts to help monarchs. Shortly after last year’s population numbers were released, severe late-season storms hit monarch overwintering sites in Mexico, which scientists estimate killed anywhere from 7.4 percent of the population to as much as 50 percent of some of the overwintering colonies. This mortality was not reflected in the official population number last year, meaning that far fewer monarchs actually survived to migrate north in the spring of 2016. In the best-case scenario of a 7.4 percent mortality, the monarch population that actually migrated north was just 139 million, not 150 million, and so only decreased by 22 percent rather than the 27 percent based on pre-storm population numbers. In the worst-case hypothetical scenario of 50 percent mortality from the storms, only 75 million monarchs would have survived to migrate north in 2016 but were able to build up their population to the current number of 109 million, showing a possible 45 percent increase in population. Whether it was favorable weather conditions throughout the rest of 2016 or the restoration of habitat for monarchs across the United States–or both–these various scenarios show that if given the right conditions and habitat, the species has the potential to recover. Even so, in any scenario, the species’ population remains dangerously low. Immediate action is needed to protect and restore monarch habitat. The good news is that on the local level, individuals can get involved by planting native milkweed and nectar plants right in their own yards. 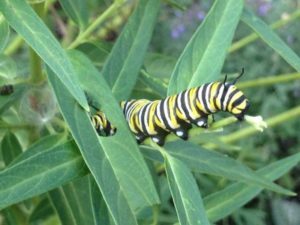 The National Wildlife Federation has engaged over 260 mayors and other community leaders in pledging to restore monarch habitat by planting milkweed as a caterpillar host plant, nectar plants for the adult monarchs, eschewing pesticides and other actions that support monarch populations. These cities and municipalities in the monarchs’ main migratory flyway, from Austin, TX to the Great Lakes, are committing to create habitat and educate citizens about how they can make a difference at home. Get involved in the Mayors’ Monarch Pledge. This signature program educates millions of Americans each year on how to restore habitat for birds, butterflies such as the monarch, and other wildlife right their yards, gardens and neighborhoods. The National Wildlife Federation recognizes such garden spaces as Certified Wildlife Habitats. Over 200,000 Certified Wildlife Habitats have been designated in suburban yards, community gardens, schools, places of worship, parks, botanic gardens, zoos and other public spaces. Entire communities, cities and counties such as Austin, TX and Broward County, FL have achieved Certified Community Wildlife Habitat status. Get involved in Garden for Wildlife. The National Wildlife Federation has helped convene an unprecedented number of conservation and gardening organizations, as well as garden industry members, to launch the Million Pollinator Garden Challenge, a campaign to raise awareness on what Americans can do to help pollinators and register a million pollinator and monarch-friendly gardens by the end of 2018. Learn more about the National Pollinator Garden Network. The National Wildlife Federation is working with partners in the agriculture industry to establish more monarch-friendly practices such as adding preserving native plant buffer zones around fields and riparian areas, adjusting mowing schedules and spraying practices to minimize impacts to pollinator habitat. We are also working with the U.S. Fish and Wildlife Service, our state affiliates, and state Wildlife Agencies to create state plans to conserve grasslands, establish power line right of way habitat, and promote roadside habitat planting along monarch’s main migratory route. Learn more about Large Landscape Habitat Work. This annual campaign aims at engaging kids and families in butterfly conservation. Participants pledge to plant butterfly gardens and receive a starter kit from the National Wildlife Federation which includes native milkweed or nectar plants for monarchs and educational and how-to information on creating a butterfly garden. This spring the campaign kicks off on March 27 and goes through May 19, 2017. Get involved in Butterfly Heroes.